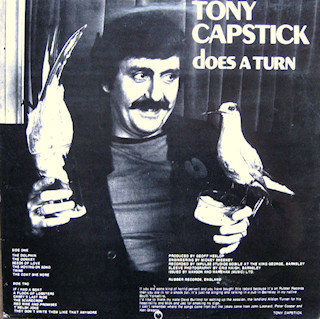 Tony Capstick was born in Mexborough, and he went to school locally, became a talented guitarist and a fine mimic. His mimicing of a celebrated "northern" television advertisement for Hovis bread, released as a double A-side single, Sheffield Grinder/Capstick Comes Home, reached number three in the charts in 1981. It was set to Dvorak's New World symphony, played by a local colliery band, Frickley Carlton Main. The song's lyrics, about a lad returning from his first 72-hour shift at t'pit with his dad (a 43-mile walk in the snow wearing clothes made from sacks), played a small part in destroying tenacious misconceptions about the reality of northern life. But Capstick also set about destroying himself through excessive alcohol consumption and never fulfilled a potential that once had Billy Connolly calling him the funniest man he had ever met. Capstick Capers was a TV show in 1983 filled with jokes and stories with weekly musical guests included Earl Okin (four times) and Peter Skellern (twice), while Capstick himself also appeared as Our Kid (northern-speak for his brother). He continued to play TV cameos in most of the region's many soaps until earlier this year (2003). He was a policeman in Last Of The Summer Wine; had parts in Emmerdale, Coronation Street and All Creatures Great And Small, and his own eight-part sketch series Capstick's Capers in 1983, but the new wave of comedy largely passed him by. He also appeared in many other TV shows including The Cops (BBC2, 1998). His career at Radio Sheffield came to an end in January 2003, when he was dismissed for an alleged drop in quality, following the latest in a string of drunk driving offences. He continued to write a regular column in a local weekly newspaper, the Rotherham Advertiser, but his mood and health never recovered from the sacking. He was found dead at his cottage in Hoober, near Wentworth, Rotherham.